Posted on November 20, 2014 by Holly K.
Good tea doesn’t last forever. Unlike wines, teas usually lose their spark over time. 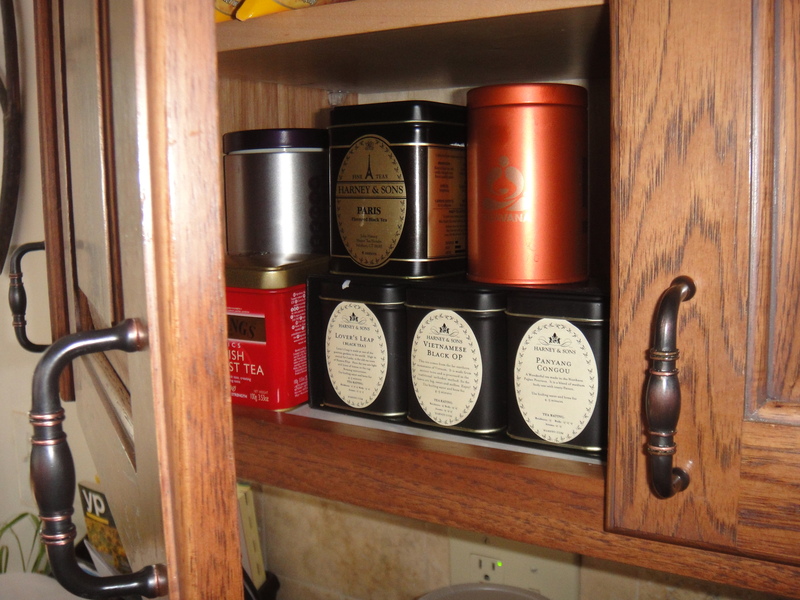 Properly storing your tea will get the most out of its shelf life! Light – Exposure to light activates enzymes in the tea leaves that will speed up the decomposition process. This means it will get bleached out and lose its flavor faster. Moisture – Moisture has similar effects to light and will also reduce the tea’s life span (think about it – you steep your tea by putting it in water. If there’s water in the environment, the tea is going to lose that flavor faster.) Also, moisture can sometimes lead to mold. Heat – Heat removes the flavor and aroma of the tea. It also increases the chance of exposure. Odors – Tea leaves are good at absorbing the aromas around them. If there’s a strong-smelling thing next to your tea leaves, such as a bag of coffee beans, the tea leaves may pick up the smell, giving you coffee-tasting tea. Air – If your tea gets exposed to air, it will get exposed to all of the other elements. The exception: pu erh. Aging pu erhs actually do best with some ventilation. Like wine, the pu erh’s character changes with time. Keep in mind, though, that it will still pick up the aromas and qualities of its environment. Keeping teas in airtight containers in a dark, dry, cool environment is the best way to store them. DO keep it in an opaque, airtight container. Metal containers like tin or aluminum work best. Some tea stores are nice enough to send their teas in resealable bags. Vacuum-sealed containers are awesome. DO clean your containers before reusing them. I learned this the hard way. Make sure any and all traces of the previous tea are gone, or else its aroma and flavor will get into the new tea. DON’T store in a humid environment. DON’T display it in a transparent container like glass. Transparent containers will expose your tea to light, which in turn may expose them to heat. Unless, of course, you can put them in an enclosed space like a cupboard. DON’T put it in a plastic container. Remember how I said tea leaves absorb odors? They can absorb that plastic odor and taste, too. Also, plastic bags might expose them to air. DON’T store it near a heat source, such as the stove or the heater during winter. DON’T put it in the refrigerator or freezer. When I’ve tried to put tea in the fridge, it sapped out some of the flavor. The freezer, meanwhile, is a topic of debate in the tea community, because Chinese vendors store their teas in vacuum-sealed containers in freezers, and some people have prolonged the life of their teas in the freezer. However, if you do this improperly, you’ll end up damaging the tea. I don’t recommend it. DON’T let the leaves get crushed. When the leaves get crushed, they release more tannins when they’re steeped – which means the flavor is more bitter. Most teas are best for 6 months – 1 year. Green teas and green oolongs are best closer to 4 months. After this point, tea usually doesn’t go bad; it just loses its flavor and its liquor color dulls. I usually end up having to use more leaves to get a decent-tasting cup. It’s not that the tea is undrinkable, just less satisfying. What if I Have Old Tea?